We already know the close relationship between the esparto and the paper industry in the late nineteenth century, but a prominent part was also an English businessman known as William Mac Murray who is attributed a great influence in our country to be a manufacturer of wire utensils in Scotland and his company was very successful in supplying the paper industry of the whole world continuous wire mesh for paper machines. He would also become a paper manufacturer, papermaker and owner of some newspapers. In 1847 he moved to the southeast of England where he had four pulp mills. Much of the paper was made with esparto from southeastern Spain, where McMurray leased large farms for its collection, built factories where to transform it and exported it to Great Britain in its own steamboats; Due to the shortage of rags to make paper in the middle of century XIX was solved in Great Britain with the introduction of esparto as raw material. The first patent to manufacture paper and paperboard with esparto was registered in England in 1839. Several paper manufacturers experimented with specific methods to obtain pulp. From 1865 a good part of this paper was made with imported esparto from the farms that William McMurray controlled in Spain, that it climbed in barges by the river Thames from the docks of London and was unloaded in a dock Or dock at the mouth of the Wandle River, which was also owned by McMurray and became known as the McMurray Canal. William McMurray came late to the export business of esparto, but did so when the first production crisis was caused by the excessive start-up of the plant for a decade (1865-1875) and that would lead to the bankruptcy of some British companies, That managed to supplant in a short time doing much of the business. 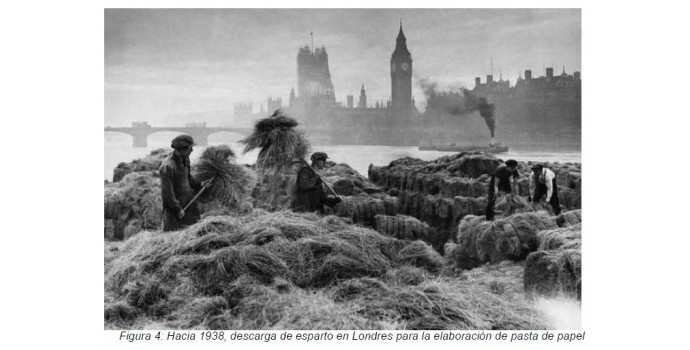 To this end, he established a company dedicated to the acquisition and export of Spanish Esparto, McMurray and Compañía de Almería, Águilas and Cartagena, which is part of its headquarters located at number 39 on Queen Street, Cheapside, London. The first major espartero business we know of was to be carried out in November 1875 in the British capital, when Esparto Fibre Company Ltd. acquired the production of the most important espartera estate in the Spanish Southeast: the Coto de Cortes, in the north of the Province of Granada, with an extension of 7,000 Ha and property of the Duke of Abrantes. The contract was for two years, forcing McMurray to pay £ 3,000 on account; But this, by postponing the payment of the obligation, would cause the ruin of the British company, we do not know if intentionally. Soon, in 1880, we find him as a direct tenant of this estate, located more than 150 km from the sea. In 1877, it would do with the production of good part of the espartizales of the provinces of Murcia and possibly Almería. The production from the south of Albacete and north of Murcia was concentrated in Cieza, home of many companies esparteras, from where it was transferred in railroad until the port of Cartagena. This sector was controlled by another McMurray nephew, George McFarlane. These two intermediate storage centers, where it is possible to perform initial cleaning and packing of the esparto, corresponded to two factories located on the coast, dedicated to preparing and pressing the esparto for export. The Aguilas, called "Santa Natalia" and located on the beach of Bol, on the outskirts of the town, along with other esparto and foundry factories, was acquired around 1875. The choice of Eagles was not accidental as it would become the The first Spanish port of esparto export, with a percentage that varied between 31 and 47% of the Spanish total during the period between 1886 and 1915. In the local press of Cartagena of August of 1879 appeared a list of the main companies of the city that included "Press for esparto. Guillermo Mac Murray, La Palma. The merchant visited his property in Spain regularly and signed commercial contracts in which he appears occasionally as a neighbor of Cartagena. The fame and influence of William McMurray in the Spanish Southeast was impressive. Thus, in the exhibition held in Granada in 1876 he was one of only two winners in the espartero branch, appearing as a neighbor of Cortes and in the press of Cartagena was called "the well-known and wealthy merchant Mr. William M. Murray". But it was in the city of Eagles that he felt more influenced. Due to its innumerable charitable works But no doubt its prestige was increased thanks to the donation that made for the opening of a promenade that, after demolishing a rocky hill, allowed to communicate its esparto factory with the new port of Levante that was constructed at that time . The municipality, grateful, decided in January of 1878 to denominate that street like "Paseo de McMurray". This denomination was preserved until the end of the 19th century, when it was changed to the current "Paseo de Parra". Subsequently, a small cross street was named "MacMurray Street". According to the chronicles, it was the largest industry of its kind in London and one of the UK's best equipped paper mills: it still provides an excellent reminder of the factory and the type of paper it produced with Spanish esparto. Soureces consulted: General archive of de Región of Murcia.